Looking for a stroller can be overwhelming when there are so many options out there. When my son was born I remember having the hardest time choosing the stroller that I wanted. As a new mom, you don’t really know what to consider when choosing a stroller. 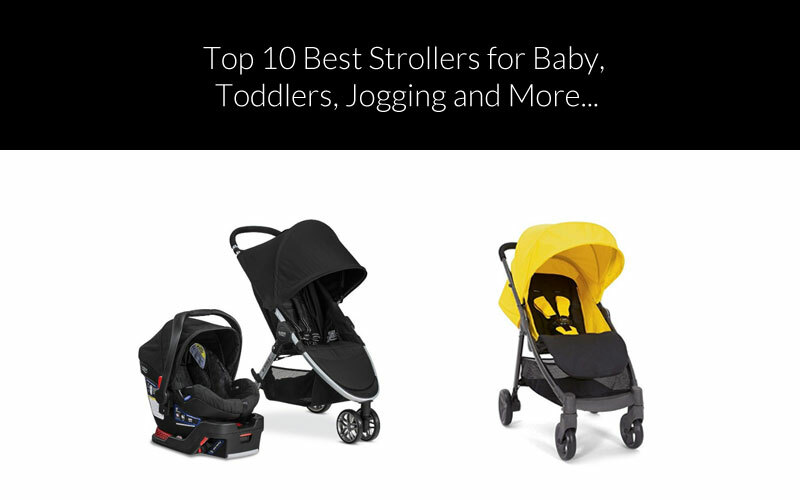 To help all you parents out, I decided to search the top 10 strollers of 2018 and do a review on all of them so you don’t have to! In this article, I will help you define what your needs are based on use and budget. Everyone looks for different features when shopping for a baby stroller including affordability! The great news is that if you have to go with a cheaper option, they still have to meet important safety guidelines, whether it’s $100 or $1500. So that already takes that off your list, safety is a given. Number 1: What are you using the stroller for? Do you live in the city, near a beach or around rough terrain? 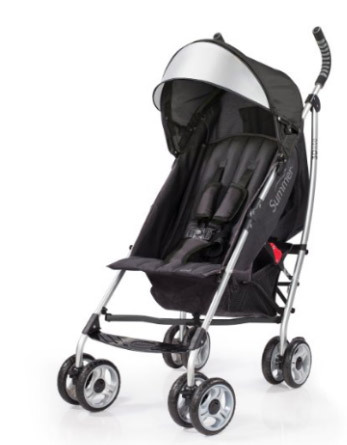 Are you looking specifically for a jogging stroller? Is your child still in a car seat and will you need to choose a stroller with a car seat attachment or travel system? Will you be anticipating a need for lots of storage space? These are all questions to consider when looking for a stroller. I suggest sitting down and making a list of things that you will need from a stroller based on your living conditions, lifestyle, health (some strollers are super heavy), etc. For example, I live in an urban city neighborhood so I knew that I would need a lightweight and compact stroller with lots of storage space because we walk a lot. I also had a c-section so having a light stroller was a must. The first things on your list should be practical items. You can then list things that would be “nice” to have but not a necessity. Budget is an important aspect of this decision, especially when there are so many different strollers to choose from. We can’t all get the most decked-out stroller with fancy add-on’s, but that doesn’t mean you have to sacrifice what you need from a stroller. As you scroll through our top picks for 2018, you will see that there are some pretty awesome cheaper options. 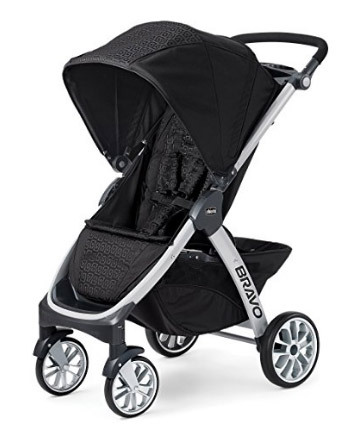 In fact, I personally have the Britax B-Agile Travel System (which is rated as one of the best strollers out there!) and I absolutely love it. I had set aside a decent budget for a new stroller thinking it would cost a lot and I ended up purchasing the Britax Travel System anyways because it fit all of my needs and wants. The price was well under budget which was a huge plus! If you want to save even more money, you can also look at the same strollers in a previous year’s model. Often times there are only minor changes with each new model, but you can save a decent amount of money. Now that you have a list of needs and a budget, you can read our reviews and see which stroller fits within those parameters! If you find that you are over budget, cut out the add-on’s and just focus on the necessary items on the list you made. If you have any questions as you look through this list, don’t hesitate to put them in the comments section below so I can get back to you! This highly-regarded Travel System by Britax comes with three parts: a stroller, a car seat, and a base for your car that allows you to quickly lock the rear-facing seat in place. 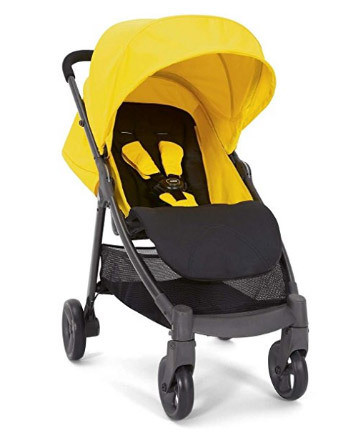 The stroller has been upgraded from previous models, however the car seat remains tried, tested, and true and is the same version that was available the year before. 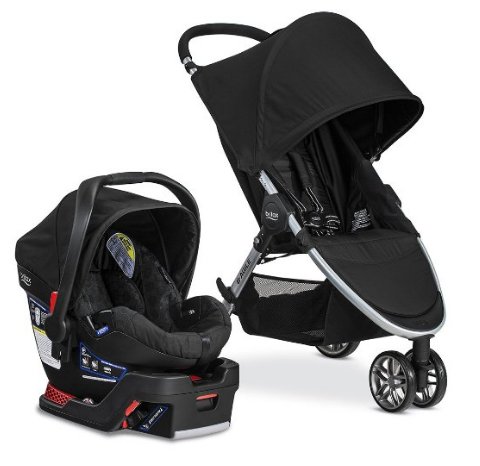 The car seat also fits the newer stroller models including the double version! When I had my second child, I upgraded to the double stroller but used the same car seat and car base! The car seat can be rear facing or forward facing when placed in the stroller which is a huge plus. Also, there are two canopies that completely enclose your baby in the car seat to protect him from the elements (can you tell I love this stroller?). Britax’s unique “Click and Go” system makes it incredibly easy to connect and disconnect to any of their car seats. The way that the above-shell is contoured means it takes up a smaller footprint in your vehicle, while also keeping your baby in a safer position with less side-to-side movement. As I mentioned earlier, this is the stroller I chose and I can’t rave enough about it. We live in the city so I needed a stroller that was super lightweight and compact. It also has a ton of storage. The price is pretty great too! This is one of the cheaper options. I would rate this one best value overall. This is an incredibly versatile stroller, it is available with just the one seat, or with an additional seat for a slightly larger family. The single seat unit is less expensive, but has all of the same features that make this a safe and practical stroller that will serve your family for years to come. Pictured above is the version of the Baby Jogger City Select that includes the second seat already, making it a quick purchase for somebody with two little ones on the go. There are at least 16 different positions you can arrange one or both seats into, and you can also remove the second seat for when you don’t need both. This is quite possibly the most versatile tandem stroller you will come across. Even if you just have one baby now, it’s not a bad idea to start with a stroller that will grow as your family does. You can mix and match between seats, bassinets, and car seats for the perfect combo to suit the needs of your family. The price is in the medium range. The BOB Revolution Pro model stroller comes in a variety of colors, and has a number of additional features that you won’t find in less expensive models. For starters, there are rear drum brakes that you activate with your hand which are very helpful for downhill control. It’s all about control, that’s the name of the game, being in control of the stroller, and where it’s moving, at any given moment. 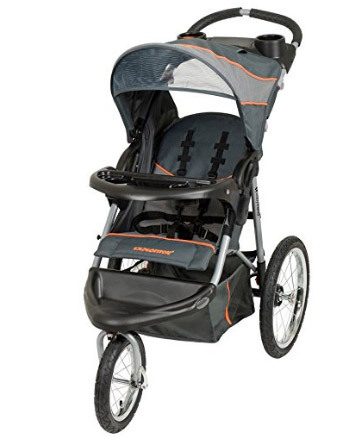 Speaking of control, this stroller features a front wheel that can either swivel to increased steering precision, or lock in place for improved stability on rougher terrain, or while going for a jog. It folds up very nicely in two quick steps, and the air-filled tires keep the ride as smooth as possible for the most important passenger. This is great if you live in a rough terrain area, like to hike or jog or just spend lots of time outdoors. This stroller does not offer an option to attach a car seat but is great if you have older babies or toddlers who no longer need a car seat attachment. 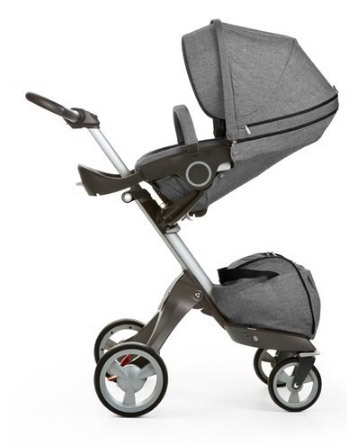 The Vista Stroller by UPPAbaby is a high-end option that lives up to the price. It is available with either carbon or aluminum frames, and can handle all sorts of terrain except for sand (like on a beach, for instance.) Bug and rain shields are included. Now, if you plan on going for jogs with your stroller, this won’t be the best choice – you’ll want one that is specifically suited to that. Otherwise, for normal everyday use, this is an excellent option. Also included is a matching bassinet. The thing that really makes this stroller brilliant is how it can adjust and grow with your family. From a standard stroller, to a bassinet that transforms your stroller into a pram, or even has room for a second bassinet for twins! It can be configured to allow you to have up to 3 babies in tow (with the purchase of additional accessories), yet still folds up small enough to take with you anywhere. If you have a larger budget, this is definitely a great option! It’s what I like to call the “posh” stroller. This is quite a good stroller at a reasonable price, it’s not on the same level as some of the higher end ones we’ve looked at, but it’s also not the greatest value like some of the less expensive ones either, so it rests in this awkward middle ground. None the less, there is a spot for this one. Just like the price and value measurements, it also fits somewhere “in between” when it comes to size. It’s very light weight, and smaller than something like a full Britax travel kit. The hard rubber wheels mean it’s not a great choice for jogging or going on tough terrain, but again – if that’s not something you plan on doing, you don’t need to worry about that. The one-hand-fold is smooth and easy to execute, making this a great stroller for a quick trip to the store, but maybe not quite enough if you’re looking for something with bells, whistles, and that can handle any kind of surface you take it on. If you like simplicity without breaking the bank, this is a good option. 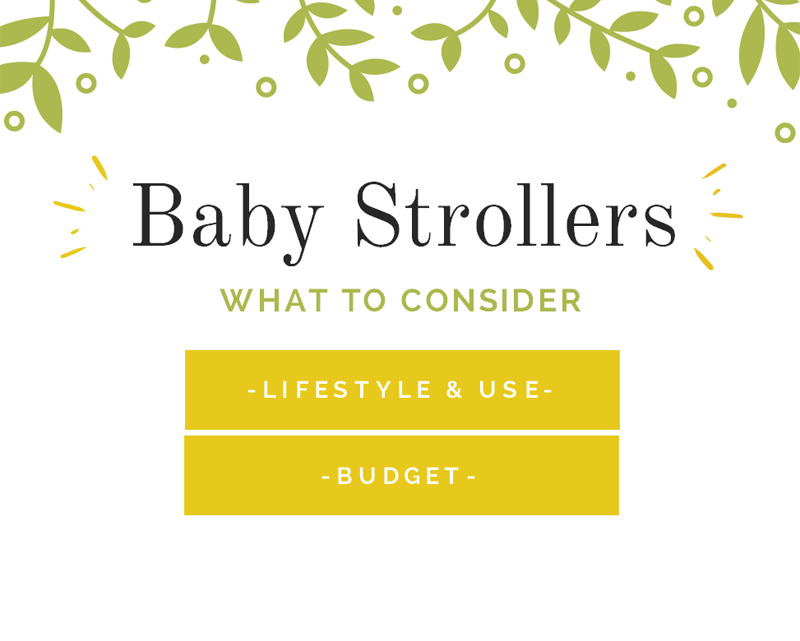 If you’re just looking for a light, basic stroller, and aren’t interested in spending a fortune or getting a bunch of features that you’ll never want or need, this may be your best budget option. Again, there are no frills here, so it may not even be suitable for your usage. You won’t want to take this one on anything other than normal, flat terrain, and you won’t be able to customize or adjust things all that much, but it does have all of the essentials like storage, a canopy, a reclining seat, and it’s very light and compact. 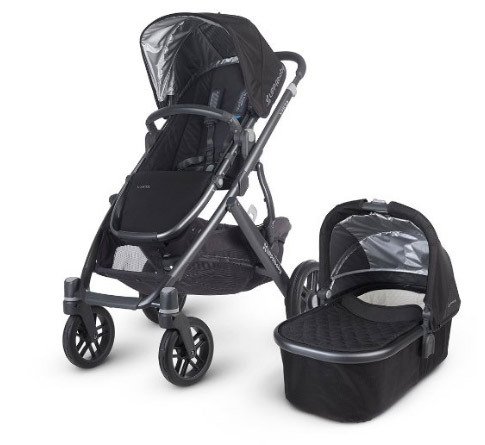 Compared to some of the other strollers we’re featuring here, this one is not the easiest to fold up, but remember: it’s an affordable option for a smaller budget, you aren’t going to get everything, but what you do get is a nice little stroller for basic use in good weather and ground conditions. 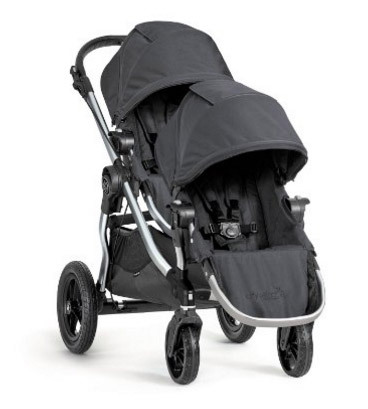 This is also a great stroller to take traveling (amusement parks, etc) or to leave as a spare at Grandma’s house! This stroller has a lot going for it, from the price, to numerous features that you won’t always find at this price point. It’s a great compromise if you want something above entry level without spending a lot of money on a luxury stroller. It’s a two-step fold, but once it’s folded it can stand upright on its own which is worth the extra moment it takes to fold up. It’s small and compact, but built very strong and sturdy. As a fun side note, this stroller has a Guinness World Record for “The World’s Smallest Folded Stroller”. This stroller is perfect if you live in a small space or just hate having all of your baby gear take over your life! There’s enough cargo space underneath to carry all of the essentials, and the front wheels can easily lock for stability, or swivel for precision steering. This stroller is all about efficiency, all around. 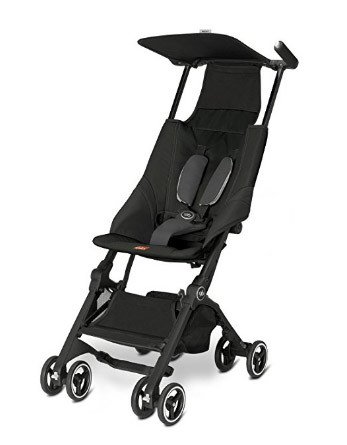 The Xplory by Stokke is a leader in its class, and sits at the very high end of the strollers we’re featuring today. The design lifts your child further away from the ground, and closer to you, for more eye-contact and interaction. Front racing or rear facing, as with many elements of this stroller, and completely adjustable to suit your needs and preferences. In terms of parent-facing positions, there are three choices: sleep, rest, and active. For forward-facing, there are rest and active positions. There are numerous accessories available to enhance the experience, from mosquito nets, to cup holders, to a matching changing bag. It is pricey but also highly recommended by those who have purchased. You definitely get your bang for your buck on this one. I love the modern, sleek look too! The Baby Trend Expedition Stroller doesn’t have the same features or frills as some of the pricier options we’ve taken a look at, but that doesn’t mean you can’t get an excellent stroller at an exceptional price. There’s a lot that is great about this stroller, beyond the fact that you won’t have to break the bank to take it home. It uses bicycle tires which makes it easy to roll along all sorts of surfaces, and helps to absorb some of the vibrations if you’re on a gravel path, for instance. It holds up fairly easily, and is made with a lightweight steel frame. The front wheel can swivel to make it easier to navigate around, or it can lock in place if you’re going for a jog. My friend bought this for me at my baby shower because she knows I love to jog. I love this stroller so much! I have an older model (2014 I believe) but it has had lots of use and is still holding up. It also has speakers where you can hookup your iPhone and listen to music, kinda cool! The Chicco is one of the best options in this price-point, because they’ve taken a lot of the seemingly smaller details into consideration, and together it all makes a huge difference. From a handle that can change height into 3 different positions so that it’s at a comfortable level for anyone, to the little convenience tray that can hold a couple of cups, a phone, whatever else you might need quick access to. This stroller is designed to work exclusively with the #1 rated Chicco KeyFit Infant Car Seat, along with the base, which are purchased separately to create a complete travel solution. This is mid-low price point. 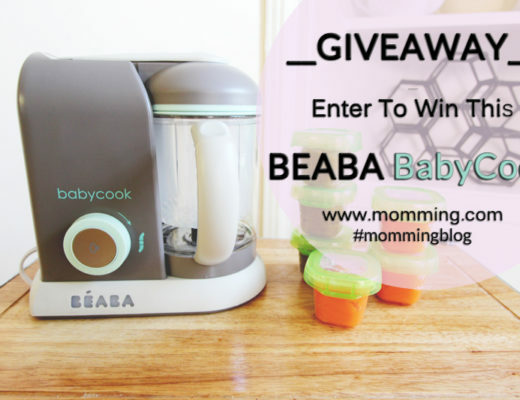 It can get spendy if you need to purchase all the add ons such as the car seat and base, but a tried and true stroller/travel system. My son Charlie in our Babytrend Jogging Stroller. Normally there is a tray with two additional cup holders. I removed it until he was a little older! 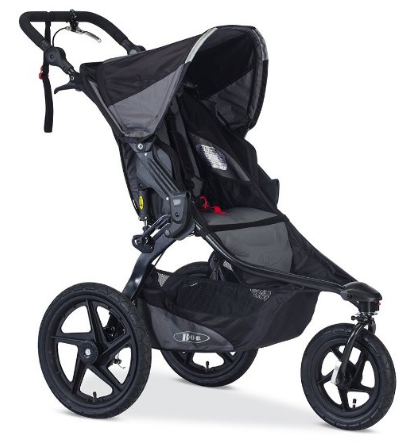 If you love jogging, I highly recommend this stroller. Great product at a great price! Well, those are my top 10 stroller picks for 2018! 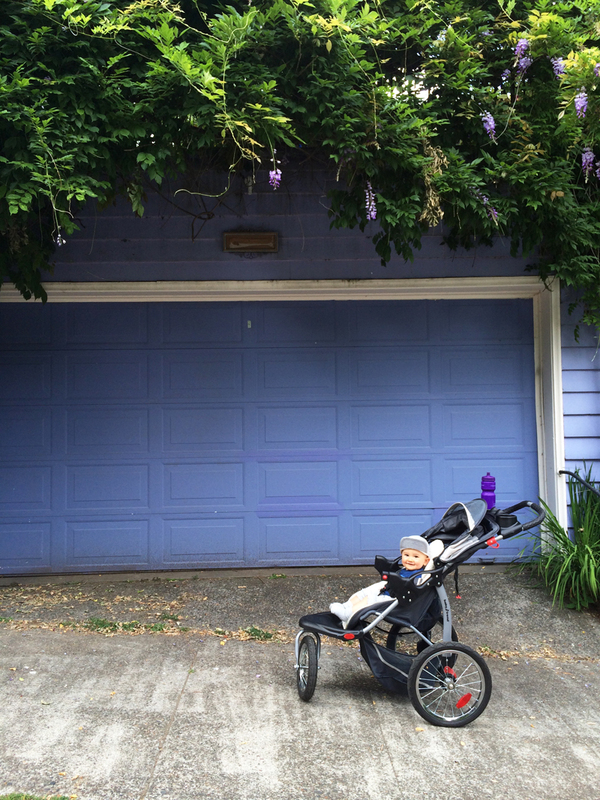 Hopefully this review helped you decide on what stroller to purchase! If you have any of these strollers or end up purchasing one, let us know which one you chose and why! Other readers can get more information from the comments section below. 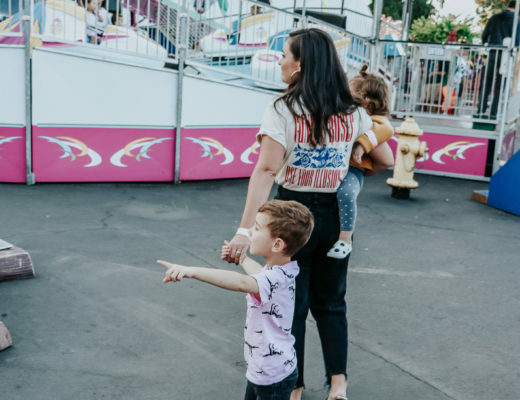 Also, if there are any strollers that didn’t make this list but are fabulous, share that in the comments as well! Here is a little infographic that you can print and take with you when you go see these strollers in person!